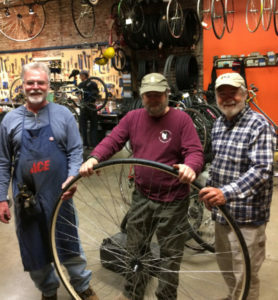 Matt Migalla (pictured at left) is modest about his contributions to the bike shop at St. Louis BWorks. But that’s where he has spent many of his Thursday evenings the past six months – and he’s proven to be a great addition to the team in that short amount of time. Whether he’s salvaging parts or refurbishing donated bicycles, Matt brings welcome energy and expertise to the tasks at hand, all of which help to support BWorks’ programs for youth. Matt started lending a hand at BWorks after coming across the organization’s booth at a winter bike expo near his home in southern Illinois. When he heard a staff member say BWorks could always use more volunteers, he jumped at the opportunity to help. “I really believe in the mission that BWorks has developed over the years,” says Matt, adding that he’s convinced the organization “walks the walk” when it comes to achieving that vision. At the same time, he sees the opportunity for growth in the level of awareness about BWorks among his neighbors on the Illinois side of the Mississippi River. “Especially in the Metro East here, a lot of people don’t know about BWorks, even though it’s been around for about 30 years,” Matt says. He’s doing his part to help get the word out and be an ambassador – and is even organizing a bike drive this fall at Cahokia Mounds, the state historic site where he has lived and worked as assistant manager for over three decades. That drive is set for 9 a.m. to noon October 7. For more information, see the event page. 1) St. Louis city has high number of cyclist and pedestrians getting hit by cars, what will you do to change this? The mayor also needs to be a better bridge builder on cycling and pedestrian issues. Too often, issues like bike lane installation have become proxy fights for larger issues pitting younger newer residents against older residents. If neighborhood planning actually begins in neighborhoods, some of these battles can be settled before lines are drawn. Although the mayor does not have direct control over criminal prosecutions, there are several ways I will protect pedestrians and cyclists. First, I will use the bully pulpit to to encourage a cycling culture in St. Louis. This includes championing special events like Pedal For the Cause and National Bike to Work Day. As Treasurer, I have placed bike racks on several parking meters across the city in efforts to promote cycling. I will also use the bully pulpit to combat distracted driving, which contributes to cyclist and pedestrian accidents. I think the mayor also needs to be a bridge builder on cycling and pedestrian issues. Often times issues like bike lane installation become proxy fights for larger issues pitting younger newer residents against older residents. St. Louis Bike Works, now BWorks, does a good job of helping kids, regardless of income, own bikes. Bicycles and cycling equipment can be expensive and intimidating to large segments of St. Louis. I want to be the mayor that helps provide families with alternatives to relying upon two cars. In fact, cycling, walking, and public transit promote healthy outcomes and can save families money. Perhaps, the most important way the mayor can protect cyclists and pedestrians is through better city planning and changing our built environment. Better planning starts on a neighborhood level. I will increase neighborhood planning across the city in efforts to incorporate smart growth principles. Our communities should be planned not just for cars, but also public transit, pedestrians, and cyclists. 2) The city’s prosecuting attorney office has an appalling prosecution rate for offenses against cyclists and pedestrians. How would you work to change this? As I stated in the previous question, the mayor does not have control over the Circuit Attorney’s Office. However, Kim Gardner and I are friends, and I will ask her personally to crackdown on distracted driving as and other crimes against cyclists and pedestrians. I also believe in focusing on deterrence programs. If the city doesn’t do the small things well – like keeping the streets paved and well marked for cyclists – residents won’t trust the city to do the big things well. 3) St. Louis city PD either does not have the resources or the desire to enforce speed limits. How would you change this? It’s probably both. St. Louis has a lot of streets. I hear from residents all over the city about the need to enforce speed limits. At the same time, I do not want to want to create a culture police profiteering by issuing an excessive number of traffic tickets. I will increase speed limit enforcement. I will also try to work with the Circuit Attorney to expand the range of options for paying speeding tickets to include community service and payment plans for low-income residents. 4) A bike share program will cost millions of dollars to start up in the city of St. Louis. Is this something you would support and explain why? I support bringing bike share to St. Louis. St. Louis is behind several of our peer cities in offering a city-wide bike share program. Even cities like Des Moines, Iowa and Omaha, Nebraska have launched bike share programs before St. Louis. Let’s be realistic. With a looming $20 million city budget shortfall, it will be difficult to bring bike share to St. Louis without significant contributions from the private and philanthropic sectors. The advantage of being a late adopter of bike share is that St. Louis can utilize what has worked and failed in other places. For instance, the failure of Seattle bike share program underscores the importance of having an adequate number of stations all over the city. Washington D.C.’s bike share program has been successful, but critics complain that its ridership is primarily upper-income and not diverse. On the other hand, Philadelphia’s bike share program has been successful because they have marketed the program to people who are not traditional cyclists. Philadelphia has bike ambassadors that have spread cycling to lower-income and diverse communities. Any St. Louis bike share program has to be intentional about reaching out to the entire city, including minorities and the working poor. 5) Would you support reducing speed limits around: Schools, Parks, Libraries and any other locations that attract young walkers and cyclists. Yes, but reducing speed limits is futile without adequate enforcement. And there isn’t enough enforcement available to be everywhere. We need to change the culture. 11 years ago, Bworks volunteers wanted to host one last event of the year to give back to the St. Louis community that supports our work with area youth all summer long. A canned food drive seemed like a good idea given the time of year near Thanksgiving. Each year the event has steadily grown and in 2015 more than 900 participants collected over 13,000 food items riding from grocery store to grocery store, purchasing food items to be donated. Registration is free and even easier now! Sign up online here and you won’t need to stand in line at the event! Click Here to Register.